One of the resounding pieces of feedback I got was regarding the colors of the blog. When I first customized my template more than four years ago, I decided to go with an olive green and red color scheme to complement the name of the blog. I liked that it felt warm, and distinguished it from other blogs. On the other hand, I know that clean and white is the way to go, but have fought it for some time. However, after getting such consistent negative feedback on the color scheme, I’ve decided to make some big changes to the look, feel and layout of this space. I’m a little afraid and sad to change what I consider my comfort zone, but it’s definitely time. Stay tuned for a new look in the coming months! ImsoexcitedImsoscared!! 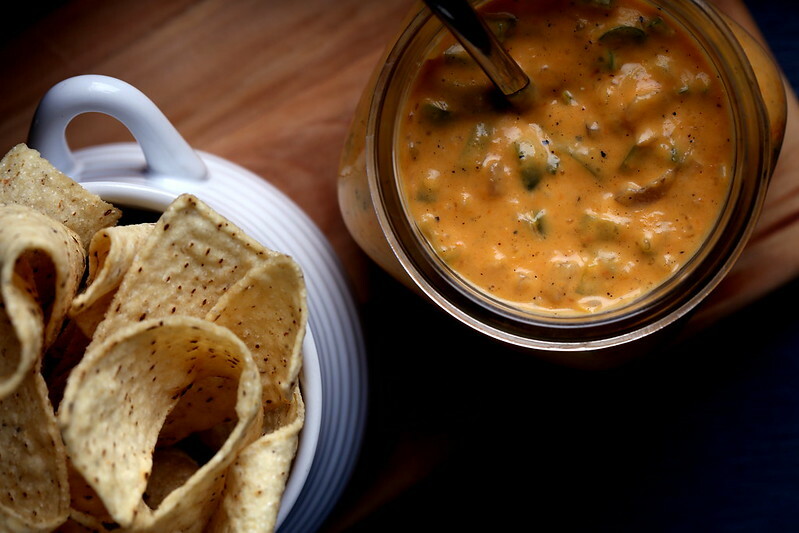 One of my favorite indulgences is my vegan queso blanco dip. What makes cheesy dip so good is that it has a good amount fat—and unsweetened, full-fat coconut milk provides a fatty richness that’s perfectly smooth and silky. The addition of coconut vinegar neutralizes the coconut taste far better than other other acids like apple cider vinegar or white balsamic vinegar in my opinion, but feel free to select and use whatever you can get. This recipe adds an entire charred red pepper to add another cheesy dimension to the dip. I did try a batch with prepared roasted red pepper, and I have to say it didn’t really work, so it’s worth the effort to char a fresh pepper yourself for this application. Once this cheese is cooked, cooled and allowed to set, you can add whatever chunkiness you want to it, or nothing at all. Serve with tortilla chips, on nachos, over a burrito or anything else that loves salsa con queso. To make the cheese sauce, add all of the base components to a blender, and blend until smooth. Transfer to a saucepan over medium heat and stir the mixture occasionally until it starts to come to a small boil. Continue to stir, maintaining the small boil for about 5 minutes more until it’s thick and bubbly. Transfer the mixture to a container and refrigerate for an hour or two to allow the mixture to slightly set up. To finish the sauce, warm the oil in a medium-sized skillet over medium heat. Add in the green pepper and cook for a few minutes. Add in the red onion and saute for a few minutes more. Then add in the jalepeno and garlic and saute until softened. Set aside or refrigerate until you are ready to serve it. Once ready to serve, warm the cheese sauce, stirring it constantly over medium heat until smooth, then add your vegetables or prepared salsa to it until it’s well combined. Serve warm or in a small crock pot if desired. 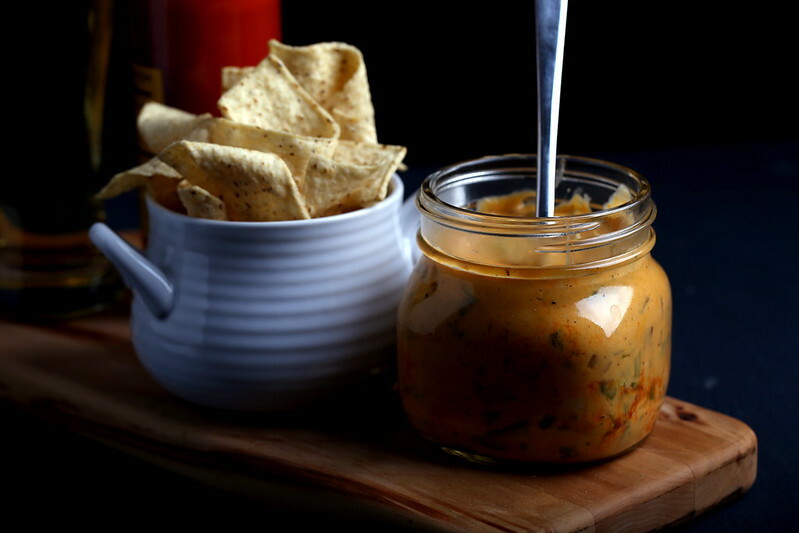 *you can add any combination or quantities you’d like to make the vegan queso chunkier or spicier. Or, you can add a desired amount of prepared salsa (drain it a bit) once the cheese has been cooked and allowed to slightly set. This looks amazing! I am adding this to my recipe book! Coconut vinegar is new to me so I am excited to expand my pantry, too! Thanks you, Nan! I hope you enjoy! I have no problem with your colors – I find them warm, too. Red and orange are said to increase appetite. Still, I look forward to your changes! I love ALL your recipes. They are always delicious and that is really what's important here – THIS I just have to try. Just call me piggy face. I also like your colors. I think it sets you aside from other blogs… Just like you said. Your food and your sites appearance all are very different. Very colorful, very unique with a bit of an international flair. I'll be sad to see it go. Don't conform too much! looking forward to your changes. i've not been that conscious of your color scheme here but now that you've called attention to it (a requirement for my senior mind) I do think a change will be positive. this recipe is everything i'm looking for in a dip. i've printed it out! that's a sure sign it will be made within the week. Thanks! It's definitely time. Hope you enjoy the recipe! I'm so intrigued by the idea of using coconut milk as the base for queso! I've had coconut vinegar in my fridge for about a year with no idea when to use it, and so I'll be eager to try this! 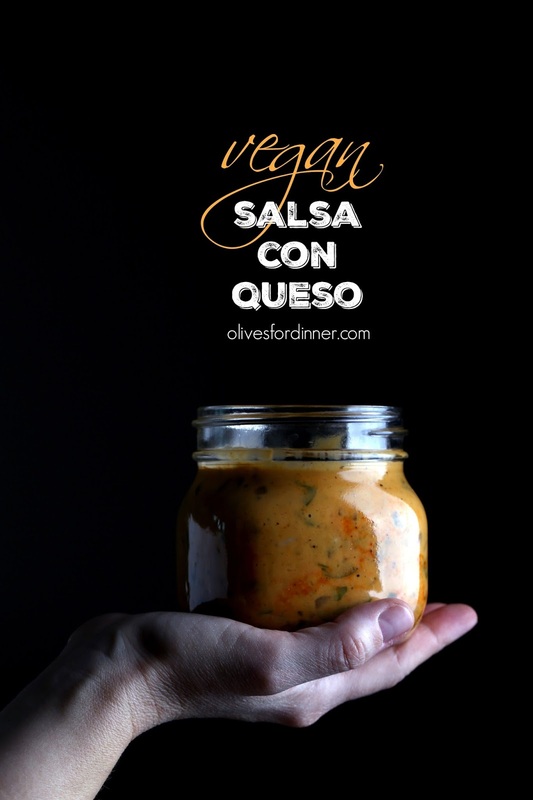 I love vegan queso in any form, and this sounds fabulous. Cadry, Coconut vinegar is so awesome — the perfect acid for balancing out anything rich or for making vegan cheese or milk. I demolish a bottle of it every couple of months. Thank you for sharing! Cannot wait to try this! Looks amazing. did you use the whole can of coconut milk or scrap the cream off the top? Joleanna, the whole can is used for this recipe. Enjoy! I finally got a chance to make this, and I can’t believe how good it was! I have to say that the onions/peppers really pushed the flavor further. I was almost going to just skip that part and stick with a non-chunky queso, but I’m glad I went forward with the full recipe.